As a result of their now rotten deck, this couple decided to give their outdoor living space new life by completely re-doing their garden floor. After conducting some initial research into composite decking, the couple visited our Slough showroom where they stumbled upon a sample of our porcelain tiles. 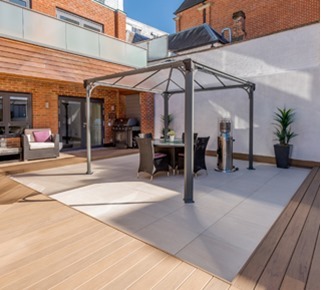 After seeing how beautiful the tile kept in various weather conditions, they decided to completely re-design their garden, incorporating both composite decking and porcelain paving. 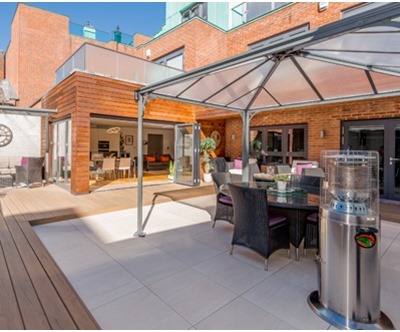 The stunning finished look was achieved using our 20mm Tirolo Cream porcelain paving. These slabs not only offer the beauty of natural stone but provide very high levels of slip resistance, making them a perfect choice for an outdoor living space. The extra levels of grip were important as the couple intended to use the space on a regular basis. “We borrowed a porcelain tile from the showroom, saw how clean and beautiful it looked in all weathers, and decided to completely redesign the whole area using PrimaPorcelain tiles. The team were extremely helpful and patient - as the project changed, they were able to talk through the various options available and prepare CGI drawings of what the finished space would look like. Greensquares, our parent company, also supplied the deck boards that you can see in some of the photos of this project. 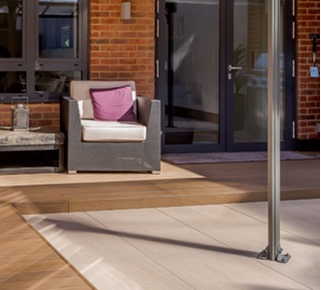 If you'd like to add both porcelain paving AND low-maintenance decking to your outdoor space, please contact us for product information. The whole team here at PrimaPorcelain are delighted with how this project turned out. The new outdoor space has been completely transformed into an area that can be enjoyed for hours. As a result of being manufactured with the highest-quality materials available, these porcelain paving slabs will look good for years to come, requiring only a wipe-clean to be maintained. We hope this couple in Windsor can now utilise their new living space for all of the dining and activities they planned on for many years to come! 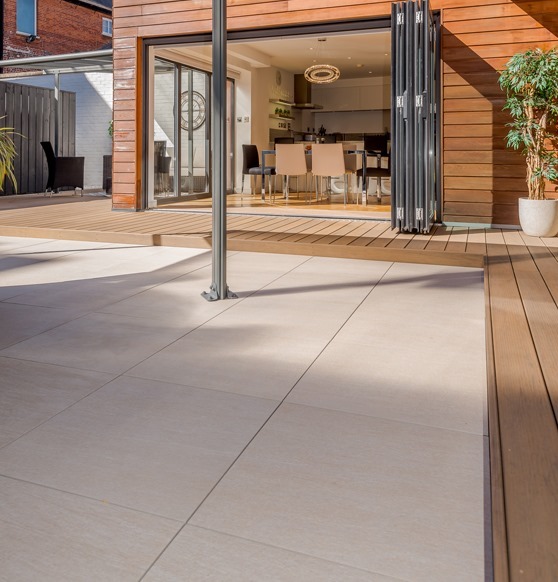 If you’re looking to re-design or create a new outdoor living space with gorgeous, low-maintenance porcelain tiles, do not hesitate to contact us today or order your FREE tile and paving samples.